Since I don’t use pop-up blockers, I figured there were two possibilities for this alert. The Ghostery extension blocked the popups. It was my Google Chrome settings. I quickly ruled out Ghostery, which left my Chrome settings. 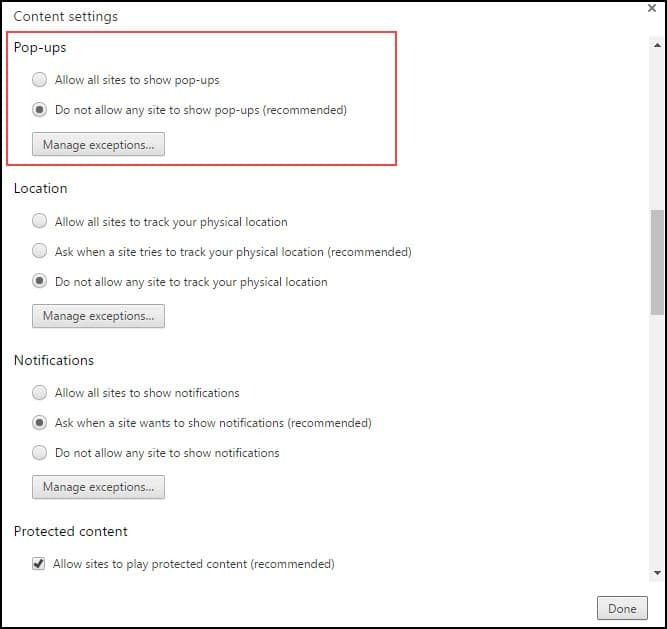 As it turns out, blocking pop-ups is a recommended setting in Chrome. Type chrome://settings/content in Chrome’s address bar. This flag is a shortcut. The Content settings dialog will open. Scroll down till you see Pop-ups. As you can see, the initial selections are either Allow or Do not allow. While I could change my option to the other radio button, I wanted something in-between. I wanted to allow popups for the lesson site – asmarterwaytolearn.com. That’s where Manage exceptions comes into play. There are actually 2 ways to manage the exceptions, but one is a subtle hint. If I had looked over to the far right on my address bar, I would’ve seen my screen briefly flash a message. It also left a clue. Notice the new icon next to my star Bookmark icon. If I click this icon, I get another dialog with 3 options. I can Manage pop-up blocking. Clicking option 1 would’ve allowed me to continue with my online course. Interestingly, Chrome is smart enough to know that I was using an Incognito session. This option will only apply when I use that option. Chrome also applied :80 to the end which I’m guessing represents the port number. 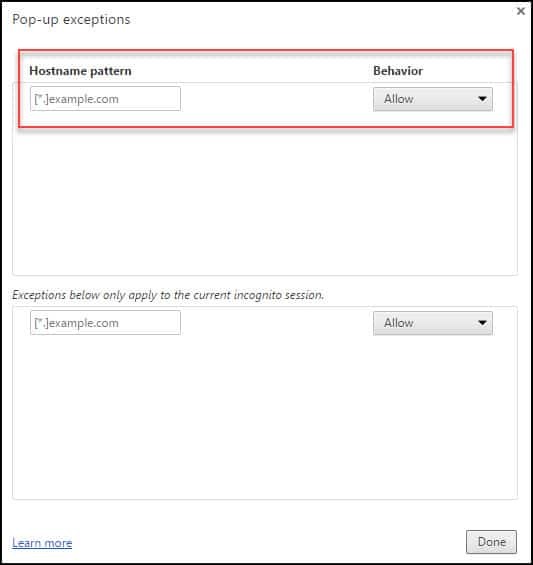 You should see the Pop-up exceptions panel that looks similar to the following. Note the [*.] before the example domain. This wildcard pattern would allow any subdomain on the site to also work. I tend to include it. Click within the Hostname pattern text box (A) and type the domain you want to allow. The [*. ]example.com will disappear. You can also type an IP address. Set your Behavior (B) to Allow. Click the Done button at the bottom. Open a new browser tab and test the domain you entered. Once an item is entered, you can either remove it by clicking the X next to the entry or changing the Behavior from Allow to Block.